Aligners are clear and nearly invisible. If you've ever seen clear teeth-whitening trays, that should give you a good idea of what the aligners look like. 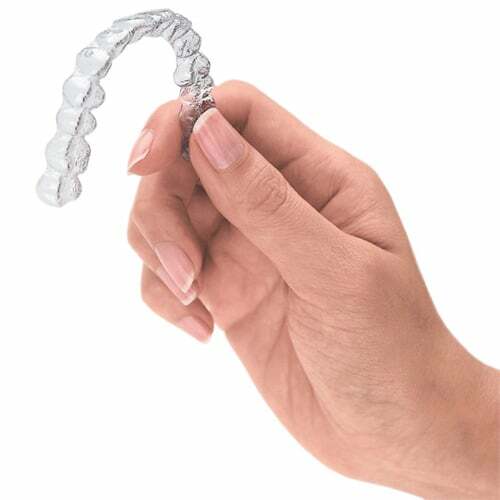 Invisalign aligners are custom-made to fit and move your teeth. Each time you change to a new aligner, there may be some temporary discomfort while your teeth adjust to their new position. This is completely normal, and is a good sign that the treatment is working. Some people are affected more than others, but most adjust in a short period of time to the feeling of the aligners and do not have permanent changes in their speech. How often will I have to wear my aligners? Invisalign only works while you're wearing the aligners. It's recommended that you wear your aligners full-time, day and night, except to eat, brush, and floss your teeth. This varies person to person and depends on the outcome of the treatment. Some patients might need a positioner, or conventional retainer. Other patients might need a clear plastic retainer.